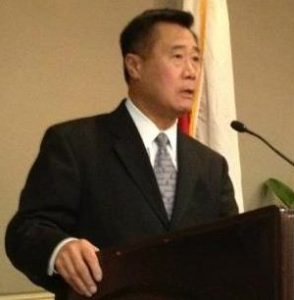 SACRAMENTO — A Santa Clara engineer who sent a death threat to State Sen. Leland Yee (D-San Francisco) was arrested on Tuesday. A California Highway Patrol investigation led to the arrest of Everett Basham, 45, who is accused of threatening to kill Lee in response to the senator’s legislative efforts to end gun violence. Bomb-making materials were found in the suspect’s home and were detonated on-site. The search for explosives and weapons continued on Thursday. “First, I want to thank the CHP and the various law enforcement agencies who are working on this case. “Four weeks ago, I received an email to my Senate account detailing a very explicit threat on my life. The author of the email specifically stated that if I did not cease our legislative efforts to stop gun violence that he would assassinate me in or around the Capitol. He stated that he was a trained sniper and his email detailed certain weapons he possessed. “This threat was unlike any other I had ever received. It was not a racist rant on my ethnicity or culture, but instead it was very deliberate and specific. As a psychologist, I was deeply concerned by the calculating nature of this email. “My chief of staff immediately forwarded the email to the Senate sergeant-at-arms and the CHP to investigate. “As you know, law enforcement made an arrest on Tuesday and executed a search warrant of the suspect’s home in which they found illegal weapons and bomb-making materials. I have no other details regarding this case and all such questions should be directed to the CHP. “With that said, I want to make it crystal clear – these threats and any others will not deter me and my colleagues from addressing the critical issues surrounding gun violence. This case is very troubling and only further demonstrates the need to address this epidemic.